ALCOHOL--THE FABRIC OF FILM HISTORY IS SOGGY WITH THE STUFF. STILL, FILM HISTORIANS HAVE RARELY GIVEN BOOZE ITS DUE. THIS SITE IS DEDICATED TO SETTING THE RECORD STRAIGHT. I had to drive forty miles out of my way today to catch Hot Fuzz, the new comedy from the team that created Shaun of the Dead, but it was well worth it. It was easily the best film I’ve seen this year, and I won’t be surprised if I’m saying the same thing in December. In short, it was brilliant--every bit as good as Shaun of the Dead. Do not wait for the DVD! 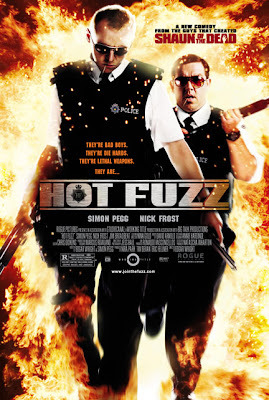 See Hot Fuzz on the big screen while you have a chance! In fact, I’d suggest seeing it this week, before theaters drop it to make room for Spidey. I’ll post an official review when the movie makes its way to DVD, because happily, Hot Fuzz features an ample amount of booze humor. 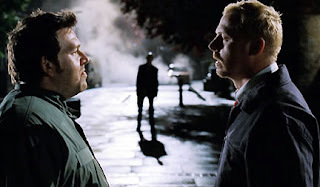 The local pub looms large in the plot; serving first as the vehicle that introduces super-cop Nicholas Angel (Simon Pegg) to his dumpy partner Danny Butterman (Nick Frost) and later as the setting for a night out that cements their friendship. Along the way, there’s a good bit of guzzling, staggering, and public urination. Like Shaun, Hot Fuzz is tightly written and directed. 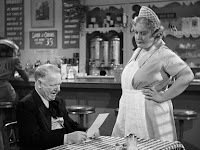 Several lines of dialogue have double meanings, and camera shots and phrases that are used early in the film are repeated later to different effect. Also, just as Shaun was an effective horror film as well as a comedy, Hot Fuzz proves that director Edgar Wright is a master of high-octane action. The Agatha Christie-like mystery scenes are also beautifully rendered. With Shaun, the Grindhouse trailer “Don’t,” and now Hot Fuzz, Edgar Wright has quickly jumped to the top of my list of favorite living directors. He appears comfortable in every genre, and film fanatics will have a field day recognizing nods to everything from The Killer to A Fistful of Dollars to Chinatown to The Wicker Man. Of course, there are more obvious references to popcorn schlock like Point Break and Bad Boys 2. P.S.--Kinks fans will be happy to hear two songs from the band's 1968 album The Kinks Are the Village Green Preservation Society in Hot Fuzz. It’s the same old story--boy loses girl; boy drowns his sorrows with flaming shots; the recently departed return from the grave to eat the flesh of the living; boy is too hung over to notice; boy attempts to save girl by taking her to the safest place he can think of, the local pub. Such is the setup for Shaun of the Dead, an instant horror-comedy classic. Few horror comedies work as both “horror” and “comedy,” and many are dismal failures by either measure. 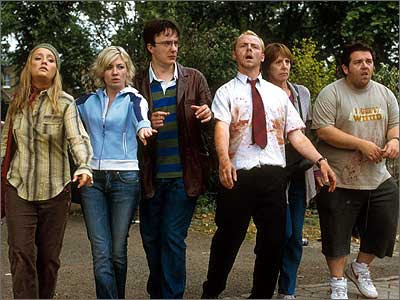 However, Shaun of the Dead, filmdom’s first “Rom Zom Com” (romantic comedy with zombies) is a triumph on all accounts. First and foremost, it is a smartly written comedy, featuring hilarious performances from its leads and expert direction that helps sell each joke. Furthermore, Shaun is no slouch in the scare department. It is the best non-Romero-produced zombie film, and viewers will find themselves on the edge of their seats during the last half hour, wondering if their favorite characters will survive the onslaught of the undead. In terms of romance, Shaun of the Dead provides two--the sweet but rocky affection between Shaun (Simon Pegg) and his girlfriend Liz (Kate Ashfield) and the even stronger bond between Shaun and his irresponsible best friend Ed (Nick Frost). 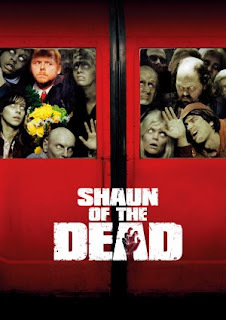 Shaun of the Dead one of the best comedies of recent years, and it is one of the few laugh-producers that actually improves upon repeated viewings. The first time around you can simply enjoy the jokes and suspense. With multiple screenings, you become aware of the craft that went into the script and filming, including lines of dialogue with multiple meanings and camera shots that are mirrored later in the film. All in all, this is a surprisingly sophisticated and flavorful cocktail. Potent Quotables--ED: You know what we should do tomorrow? Keep drinkin’. We’ll have a Bloody Mary first thing, have a bite at the King’s Head, a couple at the Little Princess, we’ll stagger back here--Bang! We’re back at the bar for shots. How’s that for a slice of fried gold? Similarly Sauced Cinema--Barrooms also served as battlegrounds with the supernatural in From Dusk Till Dawn (1996) and Feast (2006). The Three Stooges used alcohol as a plot device in a handful of their 190 Columbia short subjects--delivering barrels of beer, tending bar, and even fermenting their own brew. However, there were only a few precious moments in which the boys appeared in a state of dizzy drunkenness. 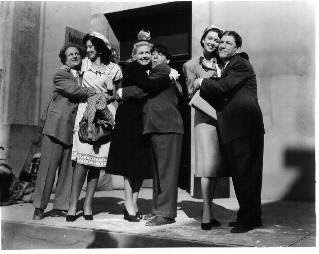 The 1950 two-reeler Love at First Bite (not to be confused with the George Hamilton Dracula spoof) is a notable example, presenting the Stooges at their most stewed. As the short begins, Moe, Larry, and Shemp are merrily decorating their apartment in preparation for a visit from their brides to be. After a series of brief flashbacks in which each Stooge explains how he met his fiancée (it seems a girl can’t resist a man in uniform, even a Stooge), the boys decide to drink a toast to their upcoming nuptials. Unfortunately, Stooges do not hold their liquor well, and within seconds the boys are fully plotzed and itching for a fight. This sets in motion a seltzer duel between Moe and Shemp; and when Shemp passes out, Moe mistakenly believes he’s killed him. Rather than mourn the passing of their pal, Moe and Larry stick Shemp’s feet in a tub of cement with plans to sink his body in the river. As you can likely tell from the plot description, this is not one of the best Stooge shorts. It suffers from an anemic script and an over-reliance on violence to elicit laughs--a criticism that is true of most of the later comedies directed by Jules White. 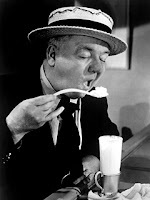 The only reason Love at First Bite works at all is due to Moe, Larry, and Shemp’s well-timed ad-libs and physical comedy skills. That said, the Stooges’ drunken antics are hilarious, and that alone makes this short a must-see. Potent Quotables--LARRY: Oh, my head! What’d we drink? Similarly Sauced Cinema--Shemp has to stay stewed in order to see Carrie, the imaginary canary with whom he is in love, in the worst Stooge short ever made, Cuckoo on a Choo Choo (1952). You’ll have to stay stewed in order to watch it. Drinky Crow and Uncle Gabby, the heroes of Tony Millionaire's underground comic strip Maakies, will make their small screen debut on May 13th! 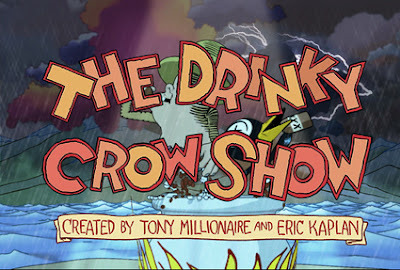 Cartoon Network will air the pilot for The Drinky Crow Show as part of their Sunday night Adult Swim block. The producers have additional episodes planned, but whether they become reality is dependent on how well the pilot performs in the ratings. To check out the press release and a video of the first 30 seconds of the show, click here. In the realm of sauced slapstick, no comedian ever surpassed the physical grace and endless invention of Charlie Chaplin. His comic inebriate act initially brought him renown on the British stage, and he carried it over onto film in many of his early one- and two-reelers. 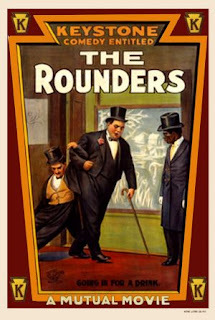 That drunkard routine is on glorious display in one of the fastest and funniest of Chaplin’s short subjects, The Rounders. Chaplin portrays Mr. Full, a dapper drunkard in tuxedo and top hat, who arrives at his hotel home after a night of immoderate revelry. 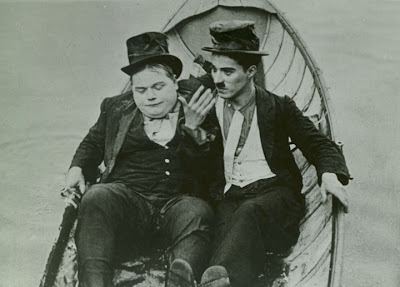 Roscoe “Fatty” Arbuckle co-stars as his neighbor, the equally well-dressed and well-oiled Mr. Fuller. Both souses quarrel with their spouses upon returning to their rooms, and before long the two couples are duking it out with each other. While the ladies continue to squabble, the boys discover that they not only share a love of potent liquids, they also belong to the same lodge. That, of course, calls for a drink, so the boozers steal their wives’ money and head for the nearest café. Unfortunately, they fall asleep before they have a chance to order a pick-me-up, which also allows the women time to catch up with them. Full and Fuller beat a hasty retreat and find a spot to snooze inside a leaky, stolen rowboat. 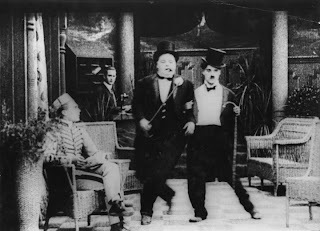 It isn’t much of a plot, but Chaplin uses every second of screen time to find new ways to display his intoxication--staggering carefully along the pattern in a rug as if walking a tightrope, getting stuck in a hunched position by stepping on the tail of his own coat, and hooking his feet over the top of his headboard after tumbling backwards onto the bed. Arbuckle lends fine support, and it’s easy to see why the baby-faced comedian was a close second to Chaplin in audience popularity at the time. Incidentally, if you visited Disney World prior to 1998, you may have seen this one-reeler in the Main Street Cinema. It ran repeatedly with five other silent shorts until the attraction was closed to make room for a souvenir shop. Video Availability--This comic gem appears within both the Slapstick Encyclopedia (Image) and The Forgotten Films of Roscoe "Fatty" Arbuckle (Mackinac Media) DVD box sets. Similarly Sauced Cinema--Earlier that same year, Charlie and Fatty boozed and brawled in the short Tango Tangles. I’ve always been lukewarm regarding the Bond series. Most of the films are overlong and mediocre, and Bond himself is a disappointment as a boozer. I mean--“Vodka martini, shaken not stirred”--what kind of a prissy drink order is that?! Shaken… stirred… who gives a ****? Furthermore, anyone that orders vodka in their martini doesn’t know squat about martinis. A vodka martini ain’t a martini. It’s slop. Give me gin, and make it dirty, Baby. That said, I always get excited when I hear a new Bond film is in the works, and for once that excitement was justified. Daniel Craig steps into the role of America’s favorite British action hero with confidence in the film version of Ian Fleming’s first Bond novel, Casino Royale. It was a wise move on the part of the producers to cast Craig. Since this film was meant to be a reboot of the series--it begins with Bond earning his double “0” status--it only made sense to engage a new actor to essay the part, and Craig immediately makes us forget the Bonds that have come before (sorry Connery). Not only is he the beefiest of the Bonds; he’s the best actor to attack the role. He brings to the part a brutality that we have not seen before, along with a surprising emotional vulnerability. Through Craig, we witness Bond grow up with every misstep, slowing morphing into the suave monster that we have grown to know in the previous movies. Like most Bond films, Casino Royale feels about a half hour too long, but that is a small complaint. 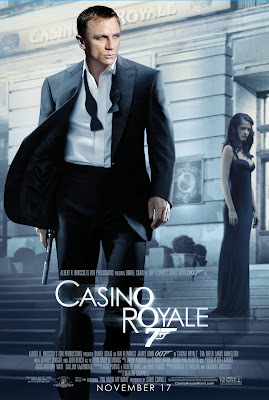 Boasting a tight script that sticks close to Fleming’s original story, less emphasis special effects, and a first-rate lead performance, Casino Royale is simply the best of the series. Even better, it’s also the booziest. When faced with difficulty, Craig’s Bond is much more likely to turn to the bottle than Connery, Lazenby, Moore, Dalton, or Brosnan. Daniel Craig doesn’t care if it’s shaken or stirred. He just wants the damn drink. Amen to that, 007. Intoxicating Effects--None. This is 007 we’re talking about. 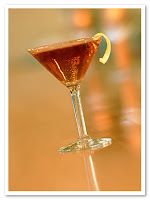 Potent Quotables--BOND (to bartender): Vodka martini. BOND: Do I look like I give a damn? Similarly Sauced Cinema--Bond first ordered a martini in the classic 007 fashion in Goldfinger (1964). The Great Man had a history of butting heads with the studio bosses over creative interference and censorship, and he used his last starring vehicle to satirize those battles for comedic effect. 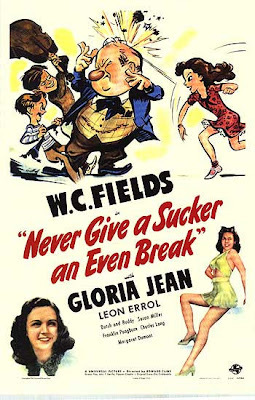 In Never Give a Sucker an Even Break, W.C. plays himself, a troublesome writer/actor by the name of Bill Fields. Yet, despite the use of his real name and a movie studio setting, no film he ever made was less grounded in reality. Sucker displays the Great Man at his most outlandish, surreal, and inebriated. 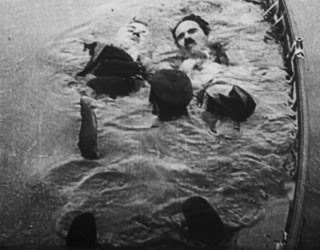 As the character of Bill Fields reads his proposed script to the head of Esoteric Pictures (played by familiar Fields foil Franklin Pangborn), the film-within-the-film depicts the loony action--W.C. jumps from an airplane to recover a fallen liquor bottle, landing in the nest-like dwelling of the beautiful Ouliotta Delight and her ghastly mother, Mrs. Hemoglobin, a rich dowager whom he later courts after downing several snorts of 100-proof goats milk! Of course, the studio head in the film refuses to produce the Great Man’s script, and in reality, Universal refused to produce any more Fields vehicles after Sucker was completed. Sucker turned out to be one of the Great Man’s funniest films. However, like many of his early talkies, W.C. is off screen as much as he is on, and the film could have benefited from more Fields and fewer musical interludes. Still, the Great Man was not in the best health at the time of making Sucker, so we should be grateful that we received a few final hilarious scenes from the screen’s greatest comedian. Although W.C. would appear briefly in four later movies, he never again wrote or starred in a film of his own. Still, Never Give a Sucker an Even Break serves as a fitting chaser to a 100-proof film career. Potent Quotables--SECRETARY (on the phone): You big hoddy-doddy, you smoke vile cigars all day and drink whiskey half the night. Someday you’ll drown in a vat of whiskey. FIELDS: Drown in a vat of whiskey; death where is thy sting? Similarly Sauced Cinema--The cartoonishly surreal gags on display in Sucker harken back to Fields’ zany 1932 comedy Million Dollar Legs. I like to drink. I like to watch movies. I like to watch movies about drinking. I like to write about the movies I’ve watched, but only if I’ve had a drink first.